Most of us are creatures of habit when we grocery shop, quickly reaching for the same products every time. When it comes to cheese, which comes in a mind-boggling array of varieties, many shoppers never stray beyond mild cheddar. Sure, it does the job, but next time consider trying a cheese that’s been around the block once or twice. Cheeses labeled “aged” have a sharp, intense taste that adds punch and sophistication to any dish. You may also find that the strong flavor of aged cheese means that you’re satisfied with less of it. Cheddar cheese is aged for a minimum of nine months, and up to 5 or 6 years. “Old cheddar” is aged for 12 months, and “extra old” has been aged for 18 months. Stronger still are those aged for 3 years or 5 years — serve them on special occasions. Generally speaking, the older the cheese the more it costs per pound. 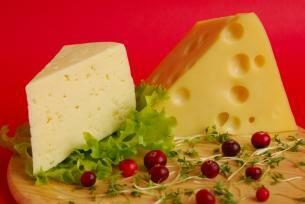 Other cheeses that grow old gracefully are Gouda, Swiss, Emmental and Monterrey Jack. Firm cheeses, like Parmesan, asiago and pecorino, have typically been aged at least two years. Their dry, hard texture makes them ideal for grating onto pasta dishes or salads. Who could resist a Sauteed Jalapeno and Aged Jack Grilled Cheese sandwich on a chilly day? Or, if you’re not into jalapenos, just substitute aged cheddar, Gouda or jack cheese for the typical processed cheese used in grilled cheese sandwiches. startcooking’s Ploughman’s Lunch, which includes wedges of sharp cheddar cheese, Branston Pickle and mixed salad, makes a great, fast meal. Try using aged cheeses on English muffin pizzas, Quesadillas or in Stove-top Macaroni and Cheese. Serious comfort food like Tuna Noodle Casserole gets its zip from both sharp cheddar and Parmesan. A Cheese Tray, with some nuts and dried fruit is perfect for entertaining. So, when it comes to cheese, out with the new and in with the old! actually i like to cook for my family..
my hubby like to eat cheesecake..do you have any recipe about cheesecake..? Chocolate Cheese Cake Pie is perfect for beginner cooks! Quesadillas with aged Gouda has been a favorite of mine for some time. Aged Gouda is fabulous! I have never actually cooked with it. I will have to give it a try on quesadillas. BTW, I love your web site – what a clever way for families/groups to share favorite recipes!